That woeful sigh you can hear? 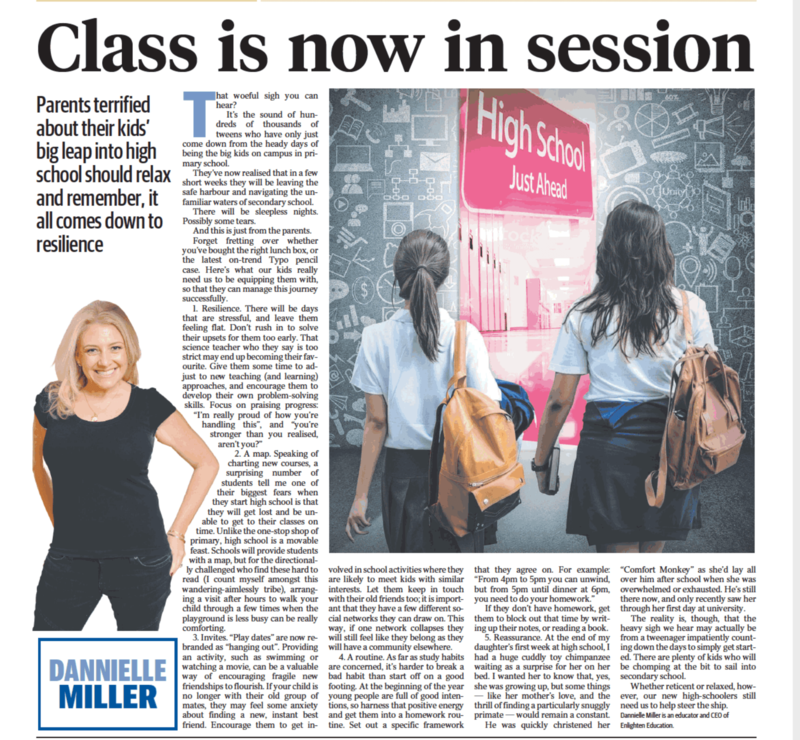 It’s the sound of hundreds of thousands of tweens who have only just come down from the heady days of being the big kids on campus in primary school. They’ve now realised that in a few short weeks they will be leaving the safe harbour, and navigating the unfamiliar waters of secondary school. There will be sleepless nights. Possibly some tears. And this is just from parents who will be angsting over everything from whether they have chosen the right school, to how they might be able to afford the school fees. Forget fretting over whether you’ve bought the right lunch box, or the latest on trend Typo pencil case. Here’s what our kids really need us to be equipping them with so that they can manage this journey successfully. 2. A map. Speaking of charting new courses, a surprising number of students tell me one of their biggest fears when they start high school is that they will get lost and be unable to get to their classes on time. Unlike the one-stop shop of primary, high school is a movable feast. Schools will provide students with a map, but for the directionally challenged who find these hard to read (I count myself among this wandering-aimlessly tribe), arranging a visit after hours to walk your child through a few times when the playground is less busy can be really comforting. Encourage your kids to join clubs and do activities to help find like-minded friends. 3. Invites. “Play dates” are now rebranded as “hanging out”. Providing an activity, like swimming or watching a movie, can be a valuable way of encouraging fragile new friendships to flourish. If your child is no longer with their old group of mates, they may feel some anxiety about finding a new, instant best friend. Encourage them to get involved in school activities where they are likely to meet kids with similar interests. Let them keep in touch with their old friends too; it is important they have a few different social networks they can draw on. This way, if one network collapses, they will still feel like they belong as they will have a community elsewhere. 4. A routine. As far as study habits are concerned, it’s harder to break a bad habit than start off on a good footing. At the beginning of the year young people are full of good intentions, so harness that positive energy and get them into a homework routine. Set out a specific framework that they agree on, for example: “ From 4-5pm you can unwind, but from 5 until dinner at 6pm, you need to do your homework.” If they don’t have homework, get them to block out that period of time by writing up their notes, or reading a book. 5. Reassurance. At the end of my daughter’s first week at high school, I had a huge cuddly toy chimpanzee waiting as a surprise for her on her bed. I wanted her to know that yes, she was growing up, but some things — like her mother’s love, and the thrill of finding a particularly snuggly primate — would remain a constant. He was quickly christened her “Comfort Monkey” as she’d lay all over him after school when she was overwhelmed or exhausted. He’s still there now, and only recently saw her through her first day at university. 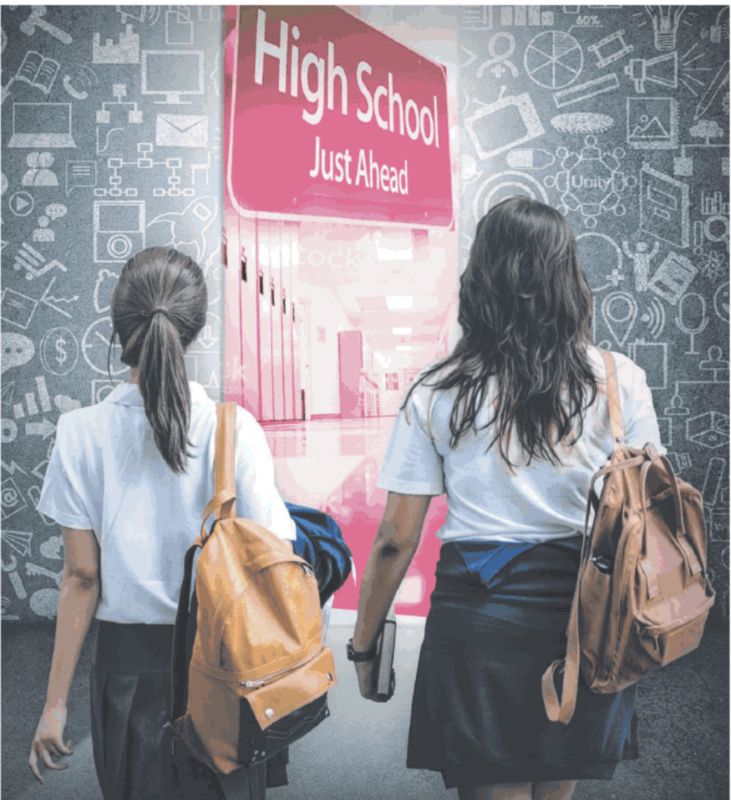 The reality is though that the heavy sigh we hear may actually be from a tweenager impatiently counting down the days to simply get started; there are plenty of kids who will be chomping at the bit to sail into secondary school. Whether reticent or relaxed, however, our new high-schoolers still need us to help steer the ship.